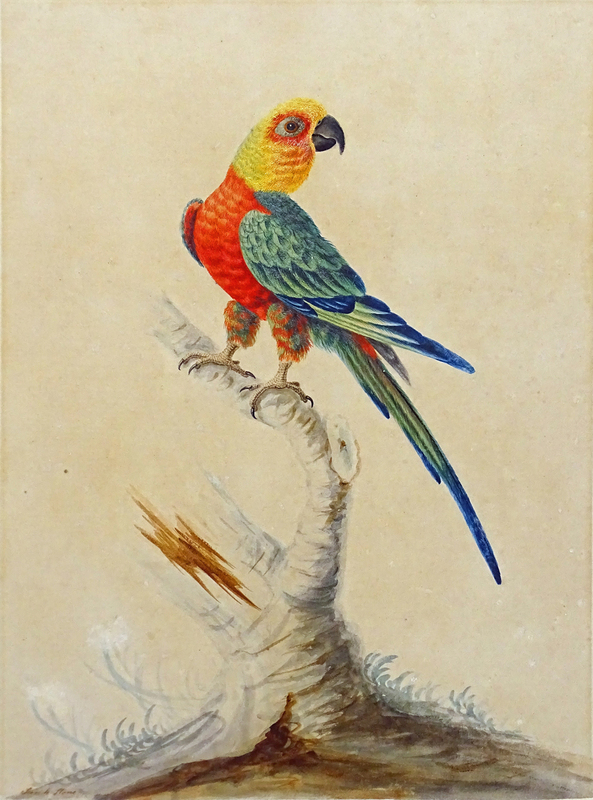 Watercolour drawing 15 ¼ x 11 ½ inches; 38.5 x 29 cm..
She married Midshipman, later Captain, John Langdale Smith in 1789, the same year that she painted Australian birds, reptiles and mammals from specimens brought back to England by the First Fleet surgeon John White. These were subsequently published in his work titled Journal of a Voyage to New South Wales. The signature on the present work “Sarah Stone” dates the watercolour to before her marriage on 8th September 1789, and before the Leverian Museum was moved from Leicester House to the Rotunda in Albion Place on the south bank of the Thames. The present species was described in detail in 1781 by John Latham (1) (1740-1837) as the "yellow-headed parrot" but (to Latham's chagrin) given its Linnaean name by the German ornithologist Johann Friedrich Gmelin (8 August 1748 – 1 November 1804) who had published his own version of Linnaeus' Systema Naturæ before Latham resorted to Linnaean nomenclature in 1790. It is likely that the present drawing was taken from a specimen brought back from Brazil and both described by Latham and exhibited in Lever's museum. The jandaya parakeet or jenday conure (Aratinga jandaya) is a small Neotropical parrot with green wings and tail, reddish-orange body, yellow head and neck, orange cheeks and black bill native to wooded habitats in northeastern Brazil. It is a member of the Aratinga solstitialis complex of parakeets very closely related to, and possibly subspecies of sun parakeet. The bird has a wide range but is locally rare in the wild; they are common in avicultur where they are known as "jenday conures". (1) Latham is known as the 'Father of Australian ornithology' from his scholarly description and classification of birds brought back to Europe from the earliest expeditions there. He was a friend and correcpondent of both Lever and Sir Joseph Banks.